47 Hereford is located on the west side of Hereford, between Commonwealth and Newbury, with 45 Hereford to the north and 49 Hereford the south. 47 Hereford was designed by Bradlee and Winslow, architects, and built in 1882 by Vinal and Dodge, masons. It is one of five contiguous houses (45-47-49-51-53 Hereford) they built for speculative sale in association with building contractor George Wheatland, Jr. He is shown as the owner on the original building application for all five houses, dated February 24, 1882. 47-53 Hereford are designed as a symmetrical composition, somewhat unbalanced by 45 Hereford. Click here for an index to the deeds for 47 Hereford. On August 7, 1884, 47 Hereford was purchased from George Wheatland, Jr., by Ellen (Nellie) A. (Strickland) Goodnow, the wife of Walter Richardson Goodnow. They previously had lived at 45 W. Newton. Walter Goodnow was a salesman and later would become a silversmith, forming the firm of Goodnow & Jenks with Barton Pickering Jenks. His brother, William N. Goodnow, a bank clerk, lived with them. 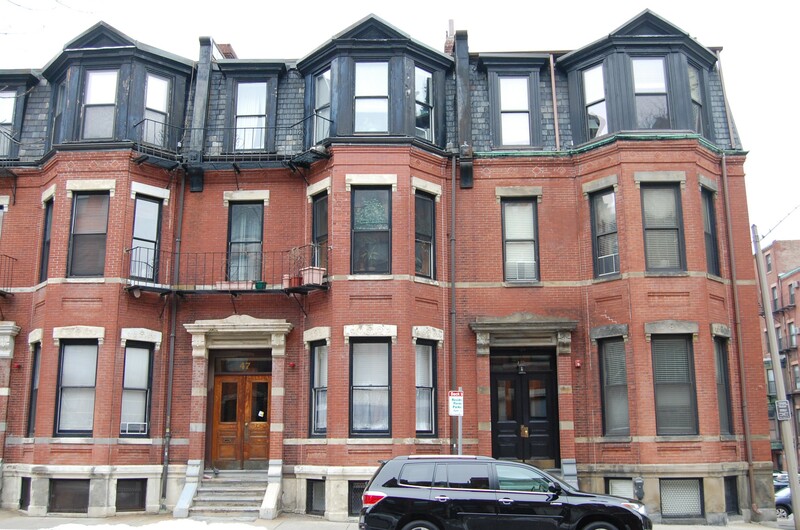 The Goodnows continued to live at 47 Hereford during the 1891-1892 season, after which they moved to the Copley Square Hotel (northeast corner of Huntington and Exeter); by 1894, they were living in an apartment at 293 Commonwealth. On March 12, 1892, 47 Hereford was purchased from the Goodnows by wool broker Gedney King Richardson. 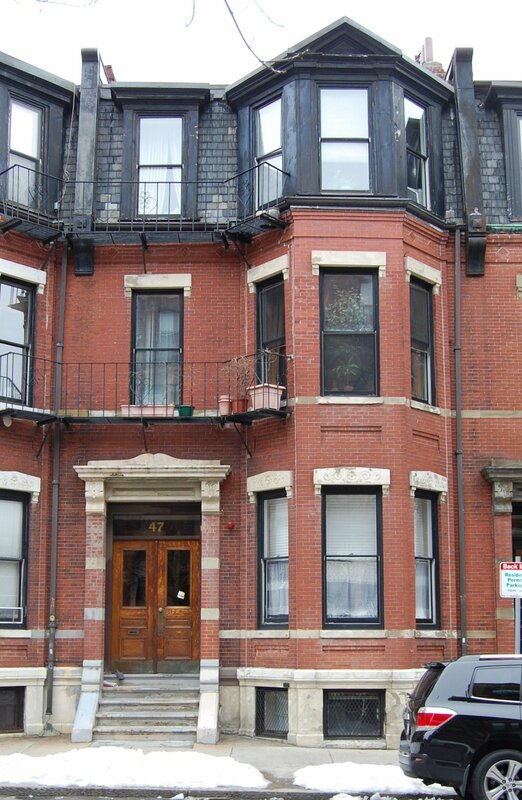 He and his wife, Alice (Gray) Richardson, lived at 492 Boylston. He purchased the property in anticipation of the marriage of their daughter, Caroline Mackay Richardson, to cotton broker Edward Cabot Storrow. They were married in September of 1892 and 47 Hereford became their first home together. The Storrows continued to live there in 1901. By 1903, they had made their home in Beverly. 47 Hereford was not listed in the 1902 Blue Book. On September 23, 1902, 47 Hereford was purchased from Gedney Richardson by Edith (Caden) Haynes Burroughs, the wife of real estate dealer George Burroughs. They had married in April of 1901. They also maintained a home, Green Meadows, in Hamilton. By the 1919-1920 winter season, they had been joined at 47 Hereford by Hiram Tuttle Folsom and his wife, Adelaide Harvey (Chase) Folsom. He was president of the New England Industrial Corporation, industrial bankers. Their primary residence was in Wenham. The Folsoms continued to live at 47 Hereford with the Burroughses during the 1923-1924 winter season, but moved thereafter to Hamilton. George Burroughs died in July of 1925 in a small airplane crash in East Boston, and Edith Burroughs moved soon thereafter. On October 31, 1925, 47 Hereford was acquired by Frederick Andrew Carpenter. He was a salesman with Leonard’s, auctioneers and appraisers, located at 813 Boylston, and later would become president of the firm. Frederick Carpenter lived at 41 Fairfield, where he had moved earlier in 1925 following his divorce from Anna Vera (Quinlan) Carpenter. Prior to their divorce, they had lived in Brookline. In 1927, he married again, to Abigail S. Beck. After their marriage, they made 47 Hereford their home. On August 21, 1929, Frederick Carpenter transferred 47 Hereford into Abigail Carpenter’s name. The Carpenters continued to live at 47 Hereford until about 1932, when they moved to Keene, New Hampshire. In September of 1932, the Building Department wrote Abigail Carpenter (in Keene, New Hampshire), indicating that it had been notified by the Licensing Board of an application for a lodging house license at 47 Hereford, and advising her of the additional egress requirements that must be met before the property could be used for that purpose. 47 Hereford was shown as vacant in the 1933-1934 City Directories. On July 2, 1934, the Franklin Savings Bank foreclosed on its mortgage to Abigail Carpenter and took possession of 47 Hereford. By 1935, 47 Hereford was the home of Frederick Grover Currie, a steamfitter, and his wife, Maude Tobin Currie, who operated it as a lodging house. They had married recently and 47 Hereford probably was their first home together. He previously had lived in Dedham and she had been a lodger at 36 Fairfield. They continued to live at 47 Hereford until about 1937. On March 15, 1938, the Franklin Savings Bank transferred 47 Hereford and a number of other properties that it had acquired, largely through foreclosures, to Charles S. Kimball. On the same day, he entered into a mortgage with the bank secured by all of the properties, and then transferred them to the Boston Management Corporation, a real estate management firm. On June 13, 1939, 47 Hereford was acquired from the Boston Management Corporation by Miss Annie Gannon, who operated it as a lodging house. She previously had lived at 34½ Beacon. She continued to live at 47 Hereford and operate a lodging house until about 1957. On August 27, 1957, 47 Hereford was purchased from Annie Gannon by William T. Stewart and his wife, Patricia (Spaulding) Stewart. 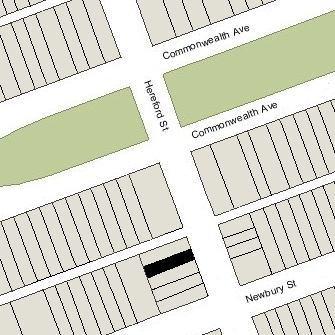 They previously had lived in an apartment at 374 Marlborough. He was an editor with the Herald-Traveler newspaper. She was a journalist and publicist, and later would become a social worker. In April of 1962, they filed for (and subsequently received) permission to convert 47 Hereford from a lodging house into three apartments. In October of 1961, they also acquired 49 Hereford. 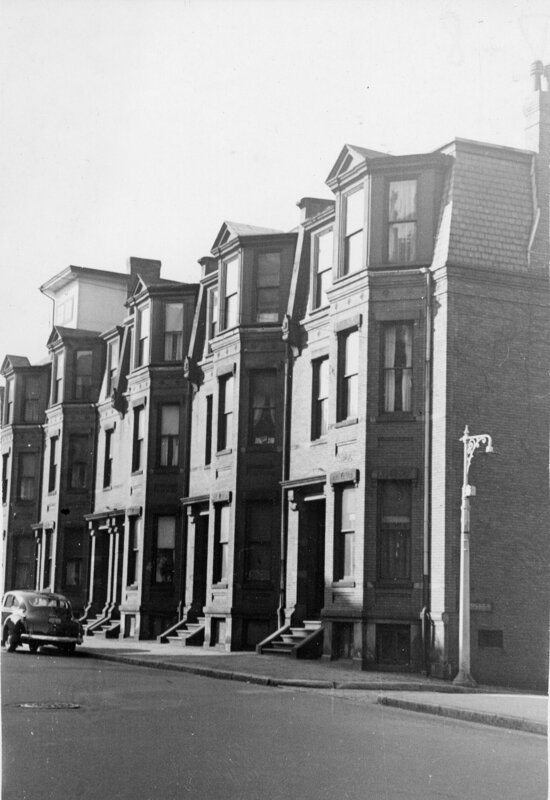 In August of 1992, Patrick Glynn applied for (and subsequently received) permission to convert 47 Hereford from three apartments into seven apartments. On December 22, 1994, 47 Hereford was acquired by the 47 Hereford Street Limited Partnership, the general partner of which was Countryside Management, Inc. (Patrick J. Glynn, treasurer, and his wife, Anne T. Glynn, president). On the same day, 49 and 51 Hereford also were acquired by parallel limited partnerships, and in August of 1995, 53 Hereford was acquired by another limited partnership of which Countryside Management was the general partner. In February of 1999, 45 Hereford was acquired by the 45 Hereford Street LLC (Neil G. Glynn, manager). 47 Hereford remained an apartment house in 2015.